A stunning hand painted Royal Doulton cup & saucer trio. Has stylised trees with a golden yellow & purple landscape. Stamped to the base (see photo). Marked to base British Airways Royal Doulton bone china made in England. White with navy blue and gold rim. Brambly Hedge 1996 Year Cup and Saucer. A now hard to find “1996 Year” cup and saucer designed by Jill Barklem from the Royal Doulton Brambly Hedge Collection. This decorative cup and saucer are now discontinued and they have been previously owned but they are first quality in very good condition. 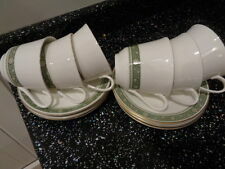 Royal Doulton "Autumn's Glory" Bone China Tea Cups and Saucers x 2. Price Is Per Gravy Boat & Saucer. Quality China At The Right Price. The cup and saucer present themselves very well. There is a small bit of paint missing at the rim of the cup but it is. Royal Doulton FUSION JIVE GOLD Cup & Saucer x 2. Royal Doulton fine English bone china cup, saucer & side plate in the 'Strasbourg' pattern H4958. Royal Doulton BERKSHIRE Teacup and Saucer. ROYAL DOULTON BERKSHIRE. A Teacup and Saucer. ROYAL DOULTON. 3 TEA SIDE PLATES AND 2 SAUCERS. A group of Royal Doulton 'Fontainebleau' china to include 8" salad plate; 6½" side plate and a spare 6" saucer. 6 x 6" tea/soup saucers from Royal Doulton in the Belmont pattern in very good condition. Super art Deco Royal Doulton cup & saucer with two side plates from the 1920's and 30's with brightly coloured enamelled flowers around all the pieces. In very good condition. Royal Doulton Yorktown Gravy Boat & Saucer (Ribbed). Otherwise In Excellent Condition. British China At Its Best. "VANBOROUGH". Lovely pieces in excellent condition in the superb VANBOROUGH pattern - pattern number H 4992. Cream soup bowls produced by the famous china manufacturer Royal Doulton in translucent china. EARLY ROYAL DOULTON EXOTIC BIRDS COFFEE CAN AND SAUCER, H1422. Susie Cooper 'Sunflower' teacup and saucer. Price is for one cup and saucer.